WASHINGTON — The U.S. Supreme Court seemed to lean toward preserving a historic cross-shaped memorial in Maryland Feb. 27 without making overall clarifications about the constitutionality of religious symbols on public property. The justices heard oral arguments about a 93-year-old cross in Bladensburg, Maryland, that pays tribute to local World War I veterans that is viewed by opponents as an endorsement of religion and by supporters as a secular monument. Before the arguments began, people from both sides gathered at the front of the Supreme Court on the chilly but sunny winter morning. The memorial’s opponents held aloft placards or wore hats or buttons with the words “#honor them all” and spoke about importance of not singling out the Christian faith tradition for a memorial when people of many faiths have fought and died in battles. 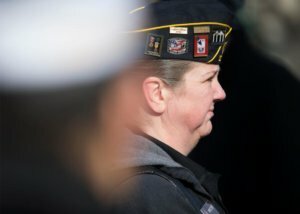 Those gathered in support of the monument, many older men in American Legion caps, insisted that the memorial had nothing to do with religion. Will Trotter, vice commander with American Legion for Maryland, said taking down the monument would be an affront to those who “fought valiantly in World War I” and to family members who wanted these men remembered in that spot and view the cross as a grave marker. Justices took in both sides in the hour and a half of arguments where they paid particular attention to whether or not the monument was endorsing or proselytizing religion and if its placement on a parcel of land on a busy road was different than on the top of a city hall building, for example. The American Humanist Association, a Washington-based group that represents atheists and others, filed suit against the memorial saying that its cross shape on public property violates the Establishment Clause of the First Amendment. The monument’s supporters stress that its message is secular: to commemorate war victims. They also have argued that its cross shape was not intended for religious reasons but to look similar to cross-shaped grave markers in Europe used for American soldiers who died there. “Figure out where you want to draw the line,” Justice Elena Kagan said during arguments about markers with religious connotations. She also pointed out some distinctions about this memorial, saying it was put up when crosses were a common way to honor those who died in World War I; it is located near other war memorials and does not include religious language. But Justice Neil Gorsuch questioned why the existence of some religious symbols is considered “too loud” or too offensive to some. One possible way to look at the cross memorial might be to accept it but not let new ones with religious imagery find a home on public property. Outside the court, Trotter, who grew up in the Washington area, has always used the Peace Cross as a marker in giving directions, and Sandra Linder, a director with the American Legion Riders from Waldorf, Maryland, and grew up near the monument considers it part of her childhood. Linder and Trotter both said they were confident the memorial would get to stay based on previous Supreme Court rulings and they both felt it was important to be on the grounds of the court that day to support it. Being outside the court, with people from both sides expressing their points of view, “is what we have fought for,” said Trotter, who served in the Air Force for 22 years. Linder, a Navy veteran whose grandfathers fought in World War II, said she was glad for decent weather the day of the arguments, but she said she would have been at the court no matter the conditions to stand up for this. A decision on the combined cases — The American Legion v. American Humanist Association and Maryland-National Capital Park and Planning Commission v. American Humanist Association — is expected by the end of June.